This project created a platform that uses high definition panoramic video and surround sound to provide individual musicians with the very realistic experience of playing in an orchestra. The expected result was an exciting new method of training musicians and allowing them to expand their repertoire. 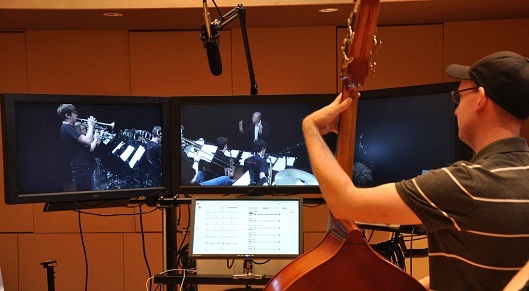 The musician sees the conductor and orchestra on a panoramic video display that uses three monitors. A fourth monitor in the music stand position is a touchscreen that displays an electronic version of the score and the controls used to operate the system. For a detailed description of the project, please use the menu at left. Photos of the workstation and camera rig are available here.